Hi! Thanks for joining me on the 2017 Holiday Party Hop hosted by the fabulous Mirabelle Creations. If you are new to our Party Hops, then you are in for a treat. You can start the hop from Mirabelle Creations and through the week make your way through 15 other creative and talented party gals to give you some of our best entertaining ideas. If you have started the hop already and are joining from Lisa Kettel (swoon! ), welcome! I am so happy to share our whimsical and easy after-school cookies & milk party. If your kids are anything like mine they head straight to the snacks when they get home, friends in tow. This means after school is one of the best times to sit them down to enjoy quality time together – eating, drinking, chatting and playing. I love hearing their happy voices chitter chatter. During the holiday season, I like to host something a little more elaborate for them. An array of holiday cookies and milk direct from the North Pole via the reindeer. Our kids look forward to this holiday ritual, full of fun and holiday cheer! This vintage reindeer village cookies & milk celebration is easy to create in your home with a few fun party supplies and easy treats. Create a North Pole village feel using white birch removable wallpaper! On top of the birch hang a beautiful holiday banner from Grey Dot Co. I love Angie’s banners, such a large selection and all so cute! I chose this one because it had all of the reindeer names on it, my daughter is loving practicing reading them! From above a hung a bunting of snowballs. The mood is set! …bring on the reindeer! From large to the smallest sitting atop the cake, I added a mix of vintage reindeer and modern woodland reindeer. Then came miniature Christmas trees. One for each side of the table. On the larger one, I hung vintage candy canes. Bright pops of candy goodness! To vary the height and give more interest to the table I placed the cake and desserts on top of birch stumps. Around the larger layered chocolate naked cake, I placed traditional Christmas lights. Pops of color, fun, and whimsy. The spirit of the North Pole is captured in the miniature village house, small enough for my reindeer friends. I also added a mini Santa and Mrs. Claus, Christmas Bells, Santas boot and Elves with attitude! 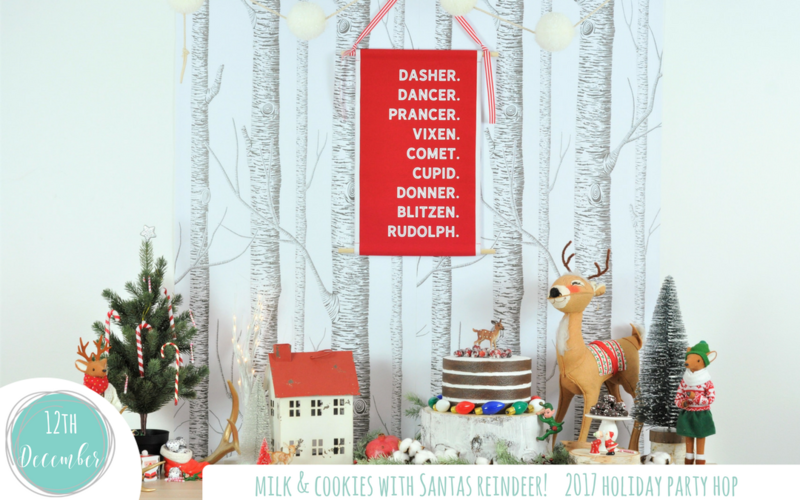 Every place setting perfectly captured sharing cookies and milk with Santa & his reindeer. The plates from Happy Heart Supply literally scream milk! I added a gold scalloped plate as a charger and sat a cookie atop with a cute vintage Santa pick. Beside each set of plates sat matching napkins with fun red Christmas cutlery. All in fun Snowmen, deer, Santa and Christmas tree design. The matching milk cup came next with a glass milk bottle filled with milk place inside ready for pouring. I found sweet vintage red plastic cookie cutters that I tied to each one as a party favor. For cookie cutting at home! I love the sweet shape, such a lovely find, less than $1 each! Milk, of course, the drink of choice. Paired with a selection of cookies, something for everyone (my favorite are chocolate chip….mmmm!). Yummy layered chocolate cake and peppermint chocolate treats were also served. No shortage of energy on hand for Santa’s little helpers! Thank you so much for joining me for on the 2017 Holiday Party Hop! I hope you enjoyed milk and cookies with Santa & his Reindeer. A fabulous after school treat and tradition for friends as they grow up together. Next, it’s time to make your way to another party stop, a visit to the amazingly talented Bird’s Party is sure to leave you inspired. Until then, happy holidays my friends. This is such a great tradition for your children and their friends! I love the vintage feeling. Takes me back to my Grandmother’s kitchen and her yummy cookies. It’s wonderful that you used things the kids can play with and not worry if things get broken. And that removable wallpaper is amazing. What a great idea for a backdrop. What a fabulous set-up! Love the woodland backdrop and that sweet deer topped cake! This is too cute. I need to make some sugared cranberries! They make everything so festive. I adore those milk plates and napkins! So fun! And that naked cake is to die for! Lo9ve every single detail!! You are amazing Natalie!! What a sweet setup! Love your DIY runner and the sugared cranberries. Nat, such a fun party! Love the cake and light bulb runner!! MUAH!!! Save a plate of these cookies and a big glass of milk for me!